We are proud to have the very talented Lu Peters as one of our members. She is a frequent attendee of the Toujour Couture neighborhood group, that meets the first Thursday of the month at Fabrique! fabrics. AND Lu will be teaching one of our workshop seminars at the upcoming “share fair” on September 27th. Lu’s latest recognition is to have her work included in the newly released book Creative Image Transfer by Leslie Riley. 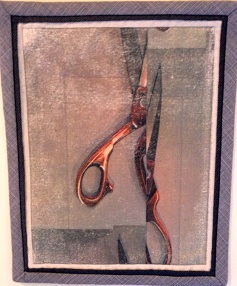 Her mini quilt, shear accident, shown on the left is TAP transfer on painter’s drop cloth, machine quilted. For those who haven’t played with TAP, it stands for Transfer Artist Paper. It allows you to to transfer images to almost any surface. For more information, or to purchase, use this link. Check out Leslie Riley’s blog for more featured artists and a chance through August 10th to win a copy of the book and several sheets of TAP. 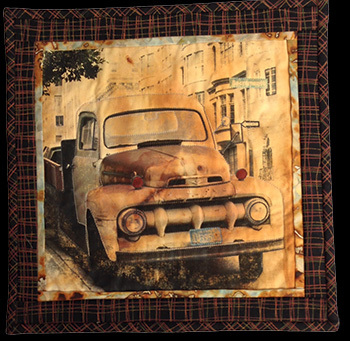 Also using the TAP process and on display at a special exhibit called Classic Cars & Trucks at the American Quilter’s Society Oct 4 show in Des Moines are two mini quilts by Lu.